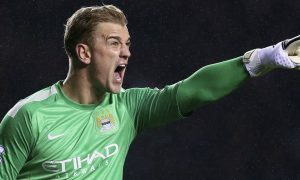 Manchester City are ready to sell Joe Hart for a cut-price fee to ensure he leaves the club on a permanent basis this summer – and a familiar face is interested in him. According to the Daily Mail, new Nice boss Patrick Vieira could offer Hart an escape route from the Etihad Stadium after two seasons out on loan. Vieira would be a familiar face to Hart from their days together at City, and Nice are among the clubs with a tenative interest in the 31-year-old. Other clubs in France, plus teams from Italy and Spain have also been keeping tabs on Hart’s situation, with City ready to ask for a small fee from any club wanting to sign him. With no future under Pep Guardiola at the club he has been with for over a decade, Hart would like a permanent switch away with the guarantee that he’ll be number one wherever he lands. Portuguese club Sporting were recently said to be preparing an offer for Hart, but his wage demands were always going to make a deal unlikely, and Sporting are now in chaos with players rescinding their contracts following an attack by hooligans on players at the club’s training ground. Hart is entering the final 12 months of his Man City contract and it’s clear that Blues chiefs are willing to make a sacrifice on any transfer fee to hand the long-time fan favourite a move away.